The Swift™ font family was designed by Gerard Unger and released by the German firm Dr.-Ing Rudolf Hell GmbH in 1987 after a three year design period. The lines of the characters follow the sweeping motions of the similarly named bird; the typeface is presently available in twenty-four variants. As a young man, Dutch typographer Gerard Unger studied graphic design, typography and type design, graduating in 1967 before taking a position at Total Design, Prad and Joh. Enschedé. However, Unger subsequently decided to take an independent route, establishing himself as a freelancer in 1975. It was after this exit from the mainstream design world that Unger’s type creation began to flourish. Working with the German company Dr.-Ing. 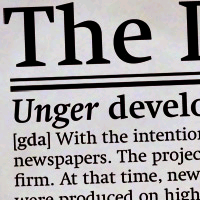 Rudolf Hell GmbH (often referred to simply as “Hell”), Unger released the Swift typeface in the mid eighties, partially to cater to the newspaper industry. In the earlier half of the nineteen-eighties, newspaper production was much less refined than later on, produced on rotary presses at very high speed, leading to a loss of legibility. Swift addressed this early problem with its robust contours, rendering the printed word much more clearly. By 1995, Unger was publishing his fonts online and re-released Swift as the Swift 2.0™ font family, using a completely new set of characters rendered in Postscript. In 2009, Unger worked with Linotype to create an extended character set and the Neue Swift™ font family was born. The newly refined font family also introduced many new glyphs per letter, allowing the publication of an expanded number of languages. When the Swift font family was released, it found widespread success in the printing industry. Its clarity on the high speed presses of the day made it a formidable force to be reckoned with in the typographic world. Almost immediately after its release, the Italian newspaper il manifesto began using the typeface for headlining purposes. Later, the Belgian newspaper De Morgen also started using Swift in its publications. Before being redesigned in 2000, How magazine used Swift extensively. Swift has found itself widely used in book publishing as well; one example is the well known Type and Typography by Phil Baines and Andrew Haslam. In the former case, the font was modified as an example of the process of utilizing a typeface for printing purposes.